This is a short update to our previous blogs about chip repairs and a little reminder of what we can and cannot guarantee. As you may or may not know, repairs are only ever an attempt at fixing a chip in your windshield. It does not guarantee that the chip won’t crack out nor does it prevent more chips from occurring. The main reason for a repair is to TRY to prevent them from spreading. Does is often work? Yes. Does it sometimes not work? Also, yes. Unfortunately, we cannot guarantee that they will 100% solve the problem. They are sometimes visible after the repair and sometimes don’t prevent the chip from cracking out later. 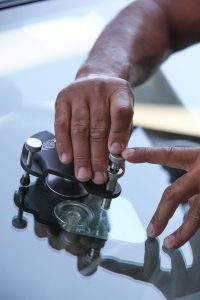 Just as we cannot guarantee that a new windshield won’t get a rock chip a day later from driving around, we cannot guarantee a repair won’t crack out that chip. We hope you understand, and we very much encourage you to get glass insurance so that a cheap repair doesn’t turn into a more expensive replacement. Thank you and happy adventures. Chips: Do they really disappear?